As much as you sometimes may want to, we all know that drinking wine from the bottle is wrong – for all sorts of reasons. But if not the bottle, which shaped glass should you use, and what is the science behind it? Well, you don’t have to be a wine connoisseur to know that the flavour of a wine is hugely affected by the shape of the glass you’re drinking it from – and aroma is probably the biggest reason why. And now, thanks to a high-tech camera system developed by scientists in Japan, we know exactly how wine’s aroma changes as ethanol vapour escapes from a glass. 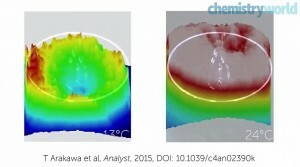 Kohji Mitsubayashi, at the Tokyo Medical and Dental University, developed a mesh which converts low molecular weight alcohols into aldehydes and hydrogen peroxide and then coated the mesh with horseradish peroxide and luminol, which together change colour when exposed to hydrogen peroxide. (Put simply, the mesh changes colour as ethanol is released). The mesh was placed on top of a wine glass and a camera captured the colour changes, mapping the concentration distribution of ethanol leaving the glass. The team looked at various wines at different temperatures in different shaped glasses, including a wine glass, a cocktail glass and a straight glass – to determine the differences in ethanol emission caused by the shape effects of the glass. The team found that at 13°C, the ethanol concentration was much higher at the rim of a traditional white wine glass than at the centre. 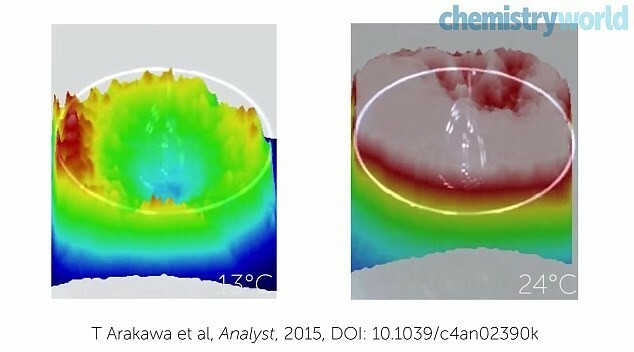 “This ring phenomenon allows us to enjoy the wine aroma without interference of gaseous ethanol,” Mitsubayashi explains. The same pattern was not evident in cocktail or tumbler glasses, or at higher temperatures. And, you’ll be most interested to know, the same concept applies to Champagne. 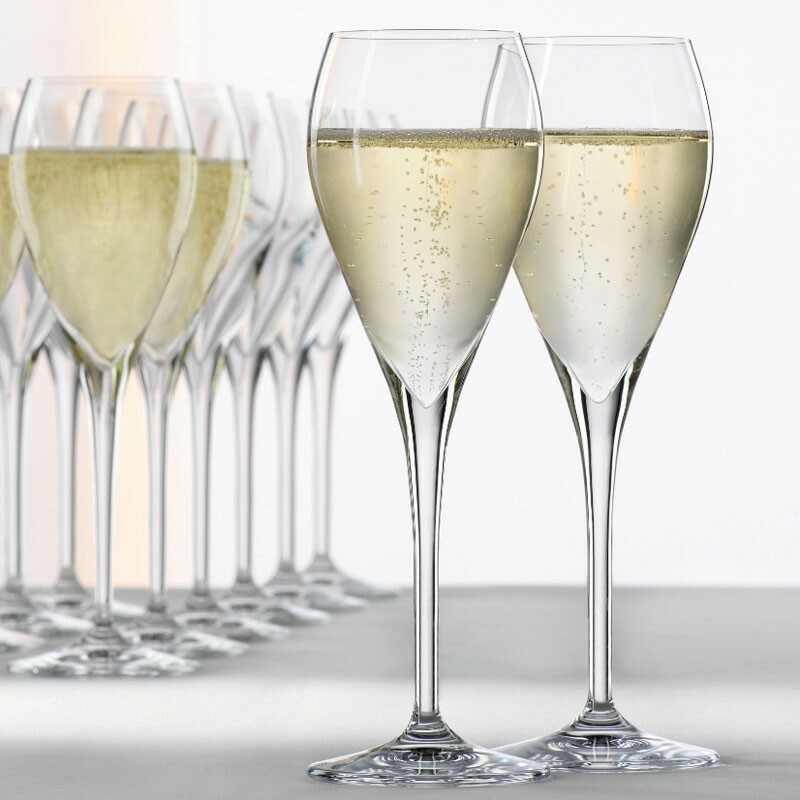 While it may be tradition to celebrate with the classic Champagne flute, prestige brands will taste much better in traditional white wine glasses. 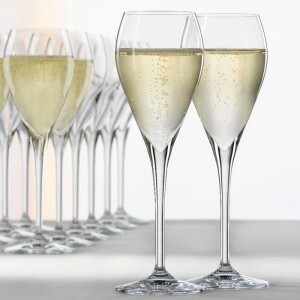 When the Champagne has complexity and depth, the aromas express themselves much better in a traditional white wine glass – the flute concentrates carbon dioxide at the top of the glass, whereas the wide mouth of a wine glass allows the bubbles to evaporate more quickly, emphasising the aromas better. For simpler Champagnes or sparkling wines, we think the classic Champagne flute is fine – after all, it keeps the wine colder for longer and shows off the bubbles better. But if you want to really appreciate a prestige Champagne (and who doesn’t? ), then you can’t beat the traditional white wine glass.